Why Are Those Coveted Navy Pilot’s Shoes Brown, Not Black? Ever wonder why, unlike all other U. S. Navy Officers, Naval aviators always wear brown, rather than the normal black shoes? 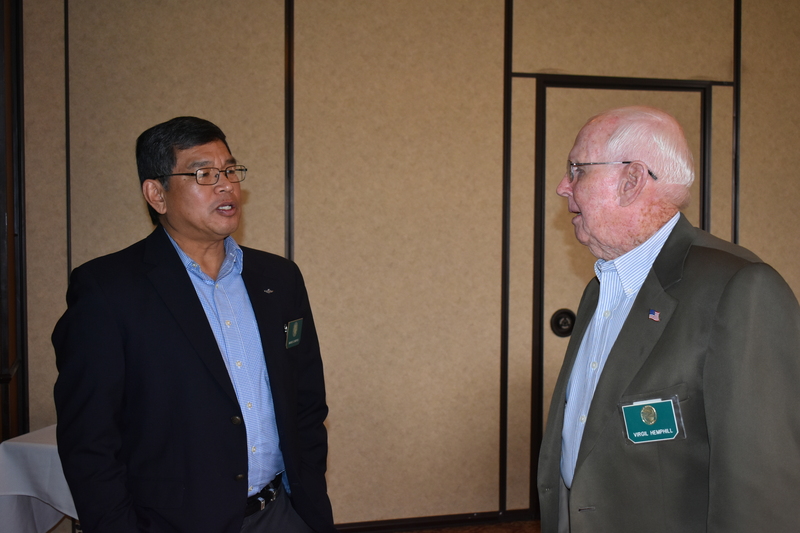 Well, FASF Aviation News Scout, and former U.S. Marine Corps Pilot, Jerry Dixon, (at Left) once again discovered another intriguing piece of U. S. Navy historical trivia. “Naval aviation officially began 08 May 1911 with the first order of a “Flying Machine” from the Wright Brothers. 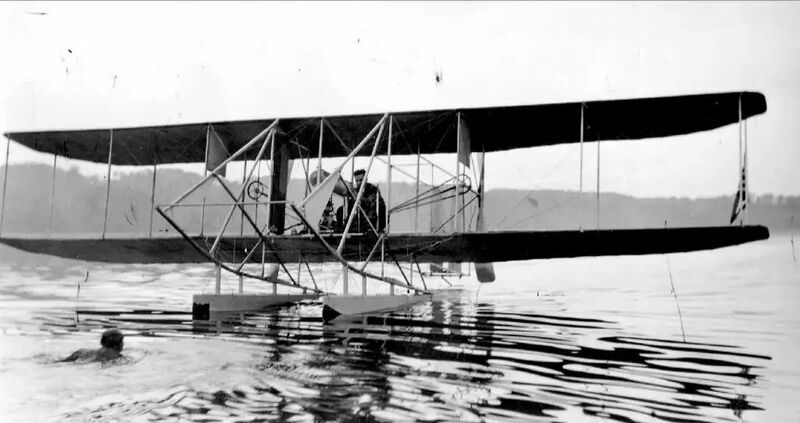 (See the photo immediately below, of the U.S. Navy’s version of the Wright Flyer – Model B) This purchase also included aeronautical training of naval personnel who would become the first naval flight instructors who would be the founders in spearheading Naval aviation as we know it today. Please keep in mind that our First Aero Squadron was also based here at Rockwell Field shortly before it moved back East to Texas, and then on to Columbus, NM, for its role in the Punitive Expedition. 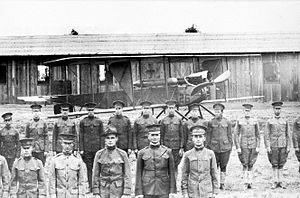 The initial cadre of First Aero Squadron Pilots had been stationed at Rockwell field, as well. Early photo of the U.S. Navy’s Model B of the Wright Flyer. To train these future naval aviators in the new Wright Brother’s flying machine, Rockwell Army Airfield was commissioned to be the first U.S. Military Flying School. Above is a 1914 aerial photograph of San Diego’s Rockwell Army Airfield, the nation’s first full-time Flight School. Although it is now called simply, North Island Naval Air Station, by its current sole occupant, the U.S. Navy. You should notice that there are no runways in evidence. This is because runways, as such, had not yet even been invented! 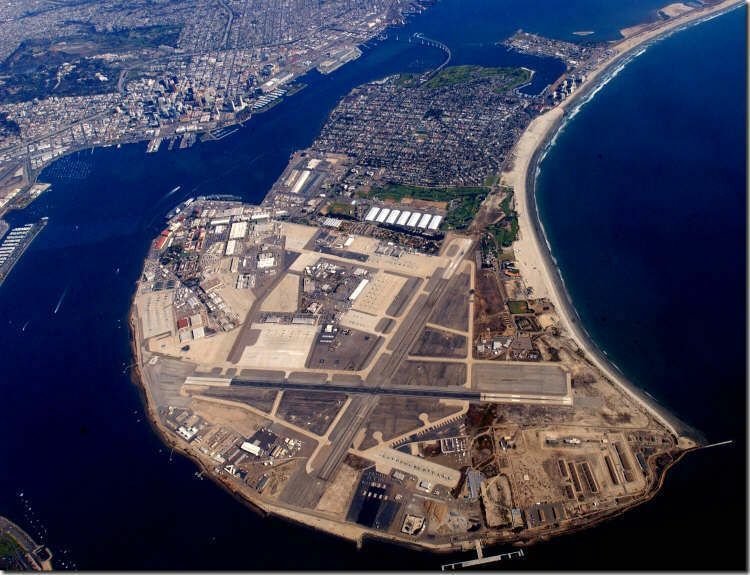 The new airfield was located on the northernmost island (see photo above) of the island chain in San Diego, California. 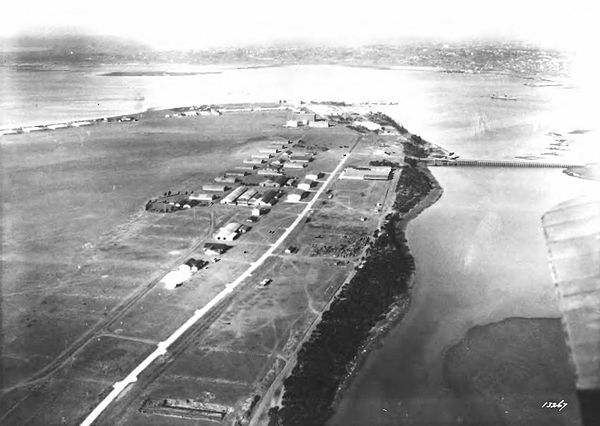 It was decided that it would be jointly shared with the Navy as the most suitable airfield site in the local area, an area chosen because the flying weather was some of the most consistently good flying weather to be found anywhere in the U.S. In October 1935, the entire Rockwell Field facility was transferred to the Navy by presidential executive order of Franklin D. Roosevelt. The last Army units departed in 1939. Later, the Army Corps of Engineers was commissioned to dredge the channel immediately to its East, and to also fill in the island’s low areas, leveling the island chain’s surface. 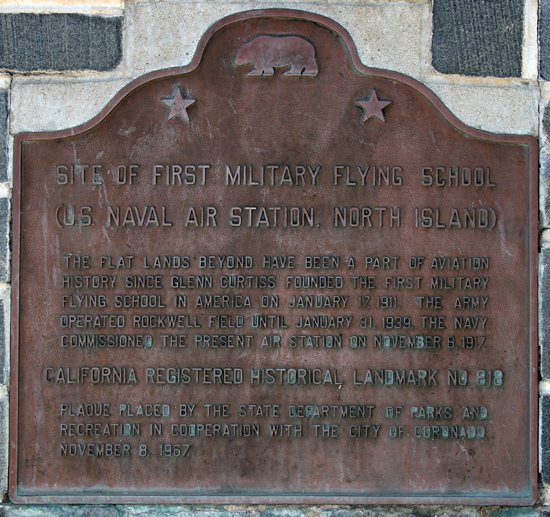 accordingly, the name “North Island” emerged as Naval Air Station North Island, San Diego, California. See a current photo just below to see how it now appears. 2017: U.S. Naval Air Station North Island, San Diego, California. This photo is taken looking to the South. The Bay, which was dredged by the Army Corps of Engineers, is to the left above. The current U.S. Navy Submarine Station San Diego, is immediately out of this picture’s bottom, across the channel’s inlet to the Pacific Ocean, the the right above. 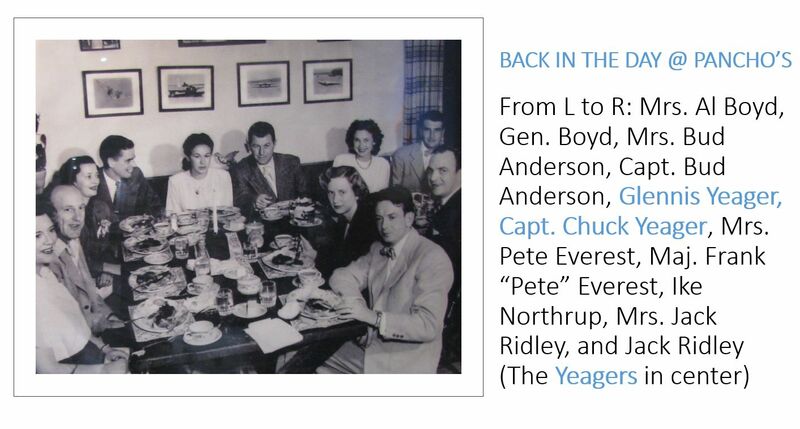 Now, quoting Commander Estes: “Six commission officers were selected from the surface fleet as the first student Naval aviation aviator trainees to be taught by these naval flight instructors. These pioneer naval aviator trainees coming from the surface fleet wore uniform low quarter, square-toed, black rough out leather shoes which served best on the coal-burning ships, which commonly produced great quantities of black soot from the ship’s stacks. Arriving for duty at the North Island Air Field for training flights, the six students experienced a foreign environment of brown dust on the soft surface air field. They found themselves being constantly required to remove the dust from their black shoes, which was irritating enough to cause them to look for a better alternative to this shoe cleaning nuisance. In the midst of their training, while often times funding their own petrol expenses, the six discussed alternatives to their problem, deciding that brown shoes might serve best to solve their problem with seniors who were putting what they felt was too much into uniform appearances. With that, all six decided that brown high top shoes with brown leggings was their solution. On a Saturday morning, the six located a cobbler shop on 32nd Street in San Diego, California whom they commissioned to produce same at a time and price they could live with. 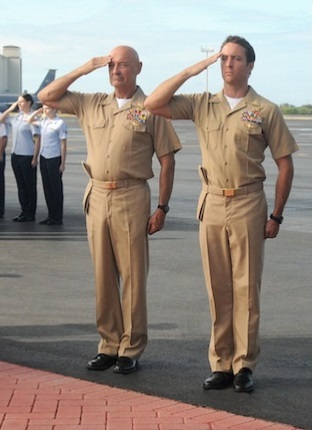 U.S. Navy officers with Black Shoes. In September 1979, I was assigned to TRARON Ten as a T-2B/C “Buckeye” flight instructor (The Dirty 100) at NAS (Naval Air Station) Pensacola, Florida. With my keen interest in history, I began initiatives to resurrect The Shoes of Brown as part of the permanent uniform for Naval Aviation in the same spirit as those in lead who first set the initiative. 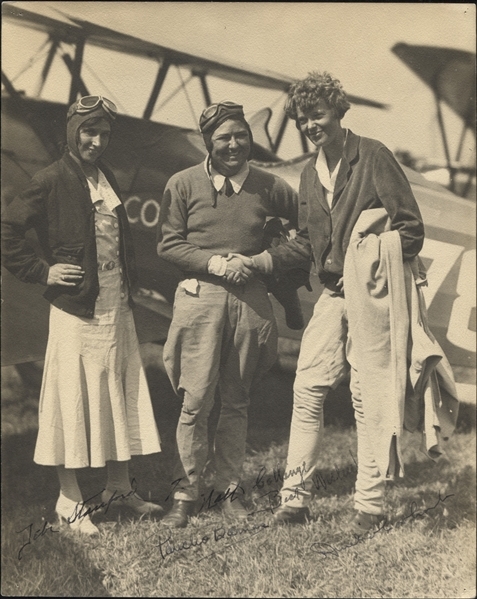 With several cross-country flights to the Naval Archives at NMPC in Washington DC, I researched for the original aviators petition in an effort to author, in kind, the same which would be reborn at Naval Air Station, Pensacola, Florida, the Cradle of Naval Aviation. Upon completion of my shore tour, I was then assigned to USS MIDWAY (CV-41). 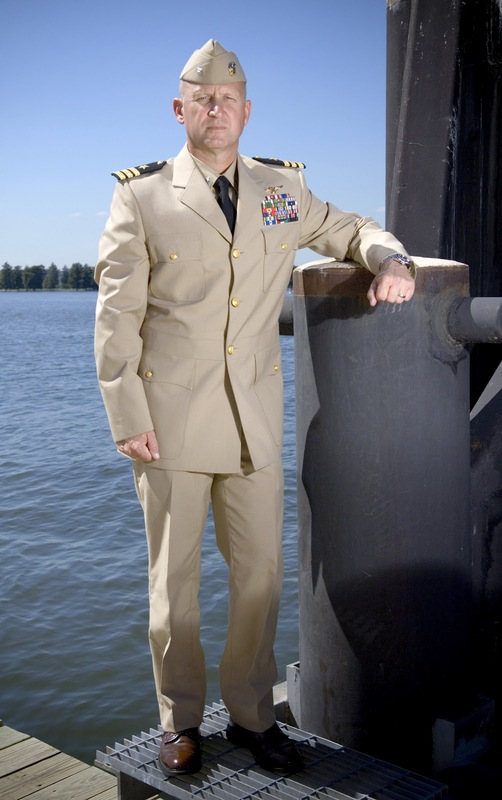 I continued initiatives with the Brown Shoes petition after receiving a “SH” approval from Commanding Officer, Captain Charles R. McGrail, Jr., USN. After an overwhelming receptive Carrier Air Wing 5 and ships company cadre, Captain McGrail later signed out the petition in Red with “forwarded Most Strongly Recommending Approval” to the CNO/NMPC on commands letterhead stationery with a personal note. 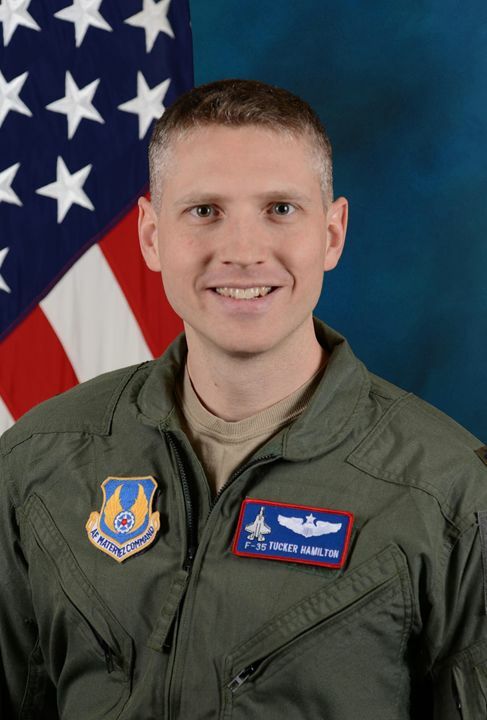 LCDR William Estes, USN Retired Aviator and Resident of Salzburg, Austria, “Flew West” on October 12, 2013. A memorial was held in his honor at Pensacola NAS, FL. This entry was posted in AVIATION NEWS and tagged 1911, 1915, Airdales, Burgess, Burgess Model H biplane, Capt. 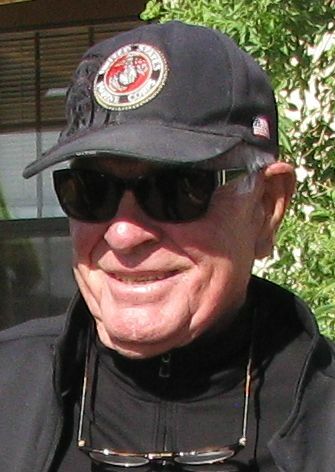 Charles R. McGrail, Capt. Jude J. Lahr, Capt. Robert L. Rasmussen, Columbus NM, FDR, First Aero Squadron, First U.S. Military Aviation Training School, Jerry Dixon, Jr., LCDR William Estes, May 8, Navy Aviators, North Island Naval Air Station, Obituary, Pat Francis, Pensacola NAS FL, Pilot, President Franklin D. Roosevelt, Rockwell Army Airfield, Rockwell Army Airfield/North Island NAS Plaque, Runways, Salzburg Austria, San Diego CA, SECNAV, Tailhook Association, Tailhooker, U. S. Navy, U.S. Marine Corps, Uniform, USMC, USS Midway, Wright Flyer Model B on November 3, 2018 by FASFRIC. To enable you to appreciate the hard, exciting – and extremely dangerous (particularly in inclement weather and at night) work of today’s U.S. Navy Carrier pilots, we’ll start out with some fair weather operations, all using the Boeing F/A-18F “Super Hornet” strike fighters of the current Navy inventory, and then move on to some videos taken during bad weather operations. This first video shows you what the experience is like during fair weather, this clip is only 2:06 long. The below Naval Aviator’s helmet says “No PRO” but after you watch him land his F/A-18F on an aircraft carrier, we think you’ll agree that he is a true professional. When you think about it, unlike Air Force and land based Marine pilots, Naval Aviators on shipboard always have an audience when they land on board a carrier, so they are at least more strongly motivated to perform at a higher level. But, regardless, audience or not, this type of landing a high-speed jet fighter is vastly more dangerous than landing the same type of fighter on land – – – at an airfield. This entry was posted in AVIATION NEWS, NEW VIDEOS and tagged Air Force, Aircraft Recovery, Aircrft Carrier, Boeing F/A-18F Super Hornet, Bolting, Carrier Break, Dangerous profession, F/A-18F Hornet Fighter, Flight Deck Crew, GoPro, Inclement Weather Operations, McDonnel Douglas F-18 Hornet, Pitching Deck Operations, US Navy, USAF, USMC on July 29, 2018 by FASFRIC. This following (top) analytical video (6:32 in length) was produced by “Covert Cabal.” Although your editor has not yet been able to ascertain the actual personal identity of the producer of this military analyst’s documentary, it was decided to feature it, anyway. Under normal protocols and precautionary procedures this fact would alone prevent us from publishing the video below, but the apparent objectivity and competency of the video itself inclines us to share it with our viewers, regardless of its anonymous nature. Once we are able to identify the owner of “Covert Cabal,” we will of course let you know. 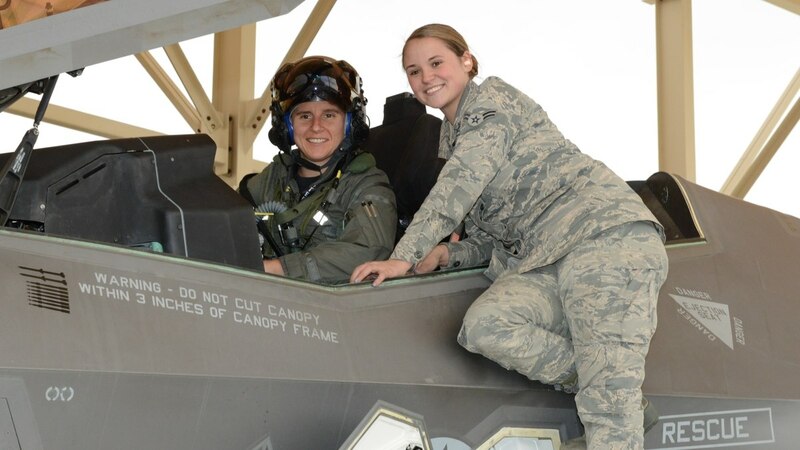 Thanks to the Society of the Daedalians and the Air Force’s 461st Test Squadron, your Editor just completed a rare “inside” tour of the F-35 Test Squadron at Edwards Air Force Base in California this past Wednesday and Thursday, but has, as yet, not received any of the tour video or stills of this newest and highly touted U.S air services multi-role asset. Your editor was expectedly prohibited from taking any photos or videos of his own, by virtue of the extreme secrecy surrounding this versatile F-35 military weapon system and platform. Any pertinent graphics of the visit we are able to share here must first be cleared by the Edwards’ and/or the Pentagon’s security offices. New F-35 Test Operation images and videos from this recent visit should be posted at some time in the near future – – – so please stay tuned. 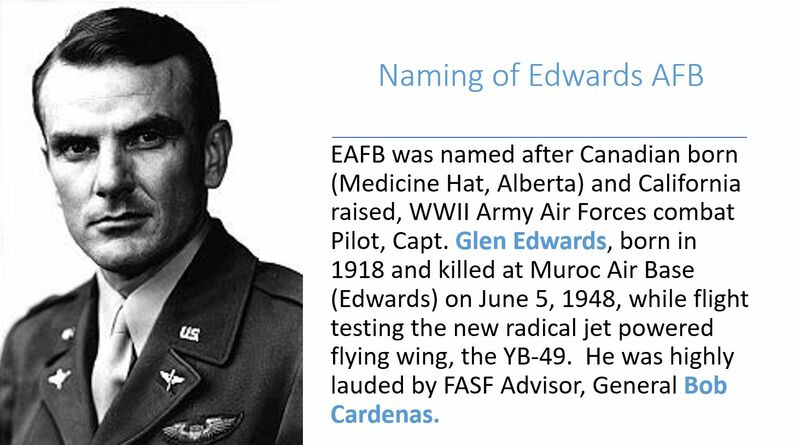 Regardless, we’d like to take this opportunity to laud the high caliber of all the personnel encountered on this visit to Edwards; all of whom, from the security guard airmen at the Base’s entry gates to the leaders and Airmen of the Test Squadron, who hosted the visit. 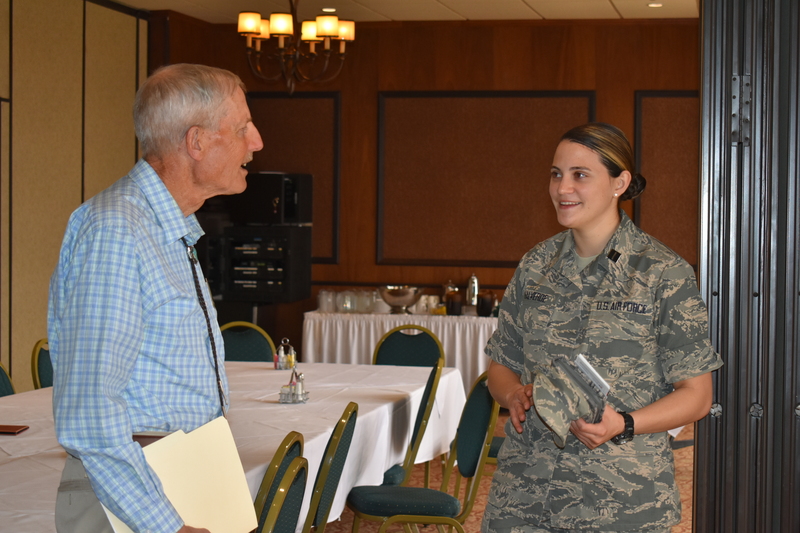 These Air Force and Civilian contractors proved beyond hospitable, gracious and informative to the extent permissible, considering the highly classified nature of their Flight Test Operation. 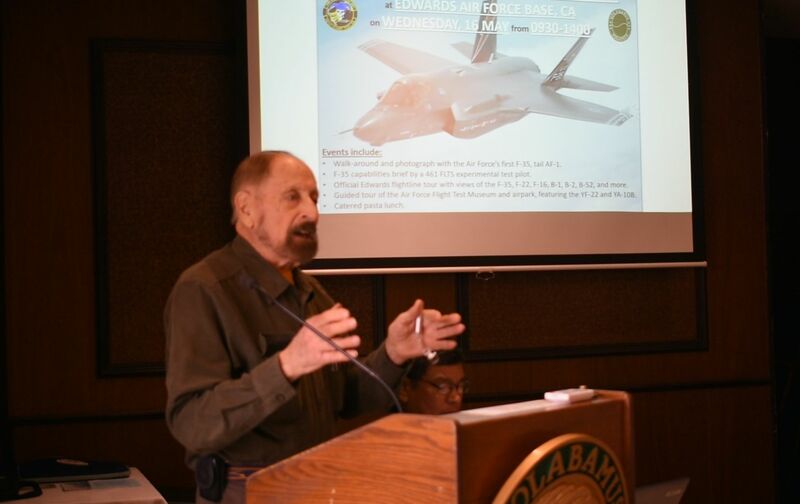 In particular, we’d like to complement the following individuals who did so much to make the visit meaningful: Steven Zapka, Public Affairs, who personally guided the visit; Stephen K. Robinson and Tony Moore of the AIR FORCE FLIGHT TEST MUSEUM at Edwards; and Lt. Colonel Tucker “Cinco” Hamilton, highly experienced Test Pilot, and Commander of the 461st Flight Test Squadron. 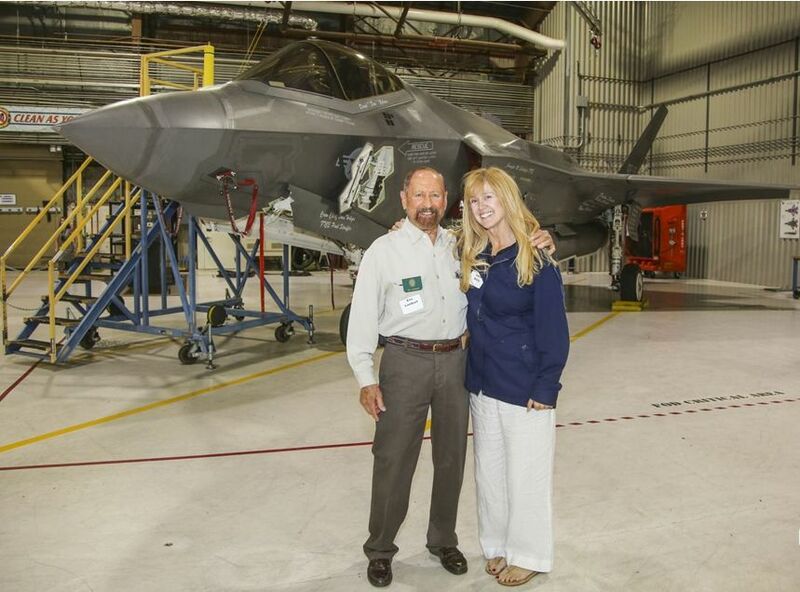 The up front coordinator of the event was Lockheed-Martin F-35 Test Pilot, Scott “Shark” McLaren. This newest Lockheed Martin multi-role 5th generation fighter, the “Lightning II,” is named after the company’s legendary twin-engine Lockheed “Lightning” fighter of WWII fame. Below is a short (3:20) video of the F-35 Joint Strike Fighter showing off its unique capabilities. This entry was posted in AVIATION NEWS, NEW VIDEOS and tagged 20 G Turn Capacity, 20 Thousand Horse Power, 5th Generation Jet Fighter, 9M96 SAM, A-10, A3D, AFFT Museum Foundation, Air Force Flight Test Museum, Anti-Radiation Missiles, Cool Air Fan, Covert Cabal, D40N6 SAM, Danger Mines, Daniel Tennant, Editor, Edwards Air Force Base (EAFB), F-14, F-16, F-18, F-35 Joint Task Fighter (JTF), F-35 vs. Russian S-400 SAM System, F-35A B & C, Flight Test Operations, Glide Bombs, Harrier Jump Jet, HD Video, IADS (Integrated Air Defense System), Inside Tour, Jamming, Lightning I, Lightning II, Lockheed-Martin, Lockheel-Martin Skunkworks, Long and Short Range SAM Systems and Missiles, Lt. Col. Art "Turbo" Tomassetti USMC, Lt. Col. Tucker "Cinco" Hamilton, Multi-Role Fighter, NATO Channel, P-38, Pentagon, Pilot's Airplane, Radar, Radar Decoys, Radar Jamming, Scott "Shark" McLaren Test Pilot, Shaft Lift Fan System, Sherman N. Mullin, Society of Daedalians, Stealth, Stephen Robinson, Steven Zapka, STOVL (Short Take Off Vertical Landing), Targeting System, Tom Morgenfeld, Tomahawk Missiles. Ministry of Defence of Russian Federation, Tony Moore, UAV's, USAF, USAF 461st Test Squadron, USDD, USMC, USN on May 21, 2018 by FASFRIC. The F-35A made its aerial demonstration debut on June 19, 2017 at the Paris Air Show in front of crowds of thousands. 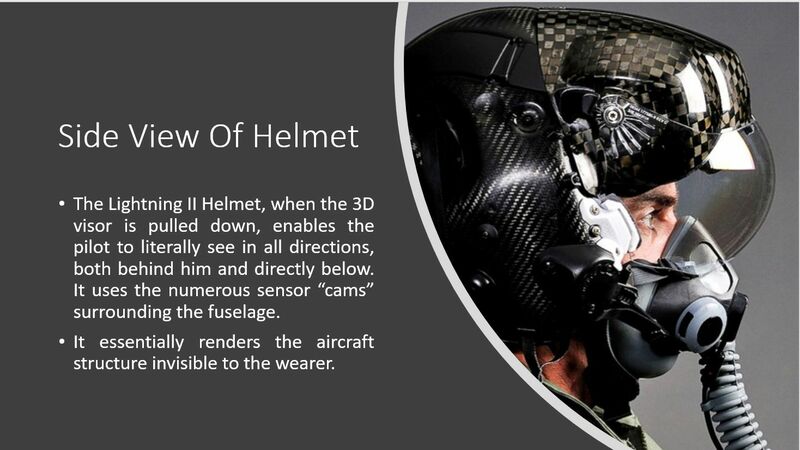 Watch this impressive display of 5th Generation innovation in military aviation. This video is courtesy of Lockheed-Martin, the aircraft’s manufacturer. The ship is currently undergoing a rich plethora of tests at Edwards Air Force Base, the Air Force’s principal Flight Test Center. The demonstration video is 6:39 long. Remember your sound needs to be on, and you might want to open the video full size, since it is in HD. And, another comprehensive video, only 2:00 minutes long, below, shows this versatile new fighter in various configurations for different mission purposes. The F-35 program has accomplished the final developmental test flight of the System Design and Demonstration (SDD) phase of the program. The developmental flight test program has conducted more than 9,200 sorties, accumulated over 17,000 flight hours, and executed more than 65,000 test points to verify the design, durability, software, sensors, weapons capability and performance for all three F-35 variants. One of these variants includes the capability to take off vertically, without the usual long runways required of such advanced fighter aircraft. Be amazed as this fighter does things seemingly impossible. You will see one of its variants taking off straight up, and doing so from an Aircraft Carrier, also. 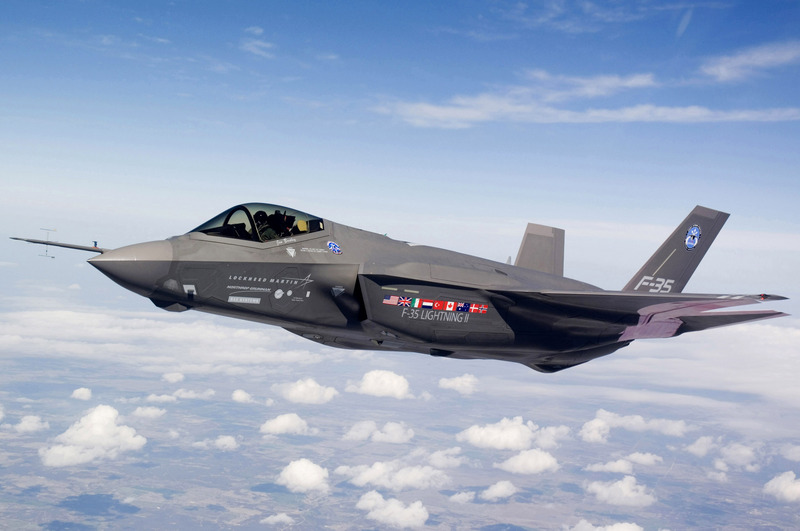 The F-35 will be used by all three aviation branches of the U.S. Armed Forces: The USAF, USN, and the USMC. Learn even more about this fighting machine right here. This entry was posted in AVIATION NEWS, NEW VIDEOS and tagged 5th Generation Jet Fighter, Aircraft Carrier, Edwards Air Force Base, F-35. Lockheed Martin, Flight Test Center, Orly International Airport Paris France, Paris Air Show, Software, Three Variants of F-35, USAF, USMC, USN, Versatile new Fighter, Vertical Take Offs and Landings on May 13, 2018 by FASFRIC.